Graham Swain was Presenter/Reporter/Producer for the Richard Noble Thrust supersonic land speed record attempt. 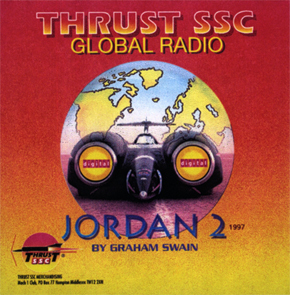 The audio on this page is selected from the global radio reports produced by Graham for the team when they were in the Al Jaffr desert in Jordan in their shakedown trials of May/June 1997, when speeds of 500 m.p.h. were achieved, subsequent to breaking the sound barrier at 763mph in October of the same year. The challenge of becoming the fastest man on Earth has certainly inspired a select band of very brave men throughout the years. Many who succeeded in their quest were rewarded with fame wealth and national honours. Many of those who failed were subject to most public and horrifying deaths. As these courageous men strapped themselves into their formidable machines, they knew they could never be in complete control of their destiny, that their next journey could be their last. And yet they were there because they wanted to be - and they kept coming back for more. Few people can understand the obsession that gripped these men, but this obsession created the ultimate form of motor racing - the quest for the Land Speed Record. 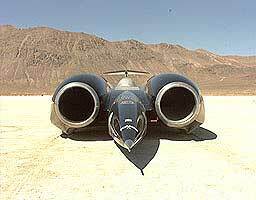 Richard Noble - the current Land Speed Record Holder for Great Britain - had a vision. To paraphrase a famous saying "to boldly go where no man has gone before", namely to build a car to go supersonic on land. The good and the mighty said it could not be done; it was treading into the unknown of physics and dynamics, with not a little concern as to safety! 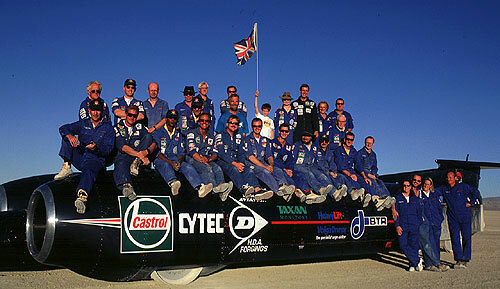 On 15 October 1997 at Black Rock Desert, Nevada, USA, Richard Noble achieved destiny for driver Andy Green, who wrote his name in the record books as the first and only man to have driven faster than the speed of sound and set the first supersonic World Land Speed Record at an average of 763mph over a two-way average run. Thrust SSC created shock waves of 150ft stretching out each side of the car (see picture above). 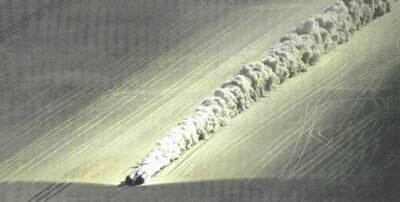 Few gave it a chance and even fewer gave it any cash, but against all the odds Thrust SSC thundered through the sound barrier! Interview with BBC Producer covering the record attempt. Interview with engineers, and report on a test run. Interview with driver Andy Green & Richard Noble about end of attempt. 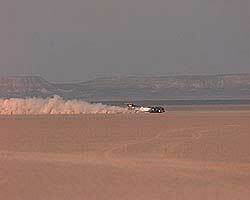 Visit Graham's TOP GEAR page for his BBC Radio Top Gear Thrust SSC features and interviews.